It’s an odd phenomenon that those of us who spend a lot of time traveling the world often forget to explore some of the natural wonders that can be found in our backyard. It’s even odder that, despite the fact that we go on trips all the time, our outdoor adventures rarely leave us time for that thing other people commonly refer to as a “vacation.” So it was a rare treat for us when we got an invite from co-owner Michelle Evans to visit The Lodge At Copperhead, a rustic resort community located about 80 miles north of Atlanta in the foothills of the Blue Ridge Mountains. Situated about halfway between the quaint towns of Blue Ridge and Blairsville, practically surrounded on all sides by the Chattahoochee National Forest, our cute Copperhead cabin provided the perfect home base from which to explore the area. Extremely popular among the area’s motorcycle enthusiasts, Copperhead includes a 12,500-square foot lodge, a welcoming Grand Hall lounge area, a comfort food restaurant, a bar that can get pretty lively on weekend nights (including karaoke on Fridays and live bands on Saturdays), and dozens of log-style cabins, all with full kitchens and modern amenities. It also offered some spectacular views of the surrounding scenery as we grilled out on the front porch of our cabin. We visited the area the last week of October, when the autumn leaves were reaching the peak of their color, providing dazzling opportunities for scenic photography. Our first stop was Vogel State Park, one of Georgia’s oldest state parks, which is located at the base of Blood Mountain. 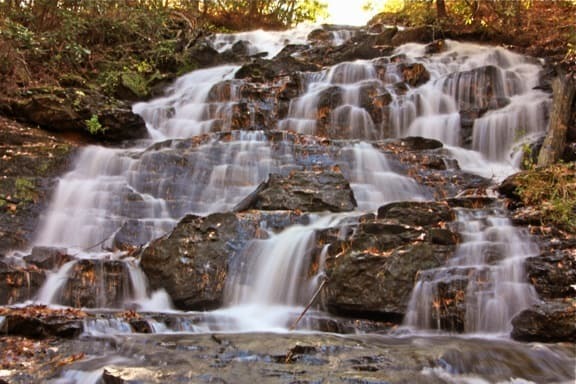 The park offers a number of hiking trails, including the popular 4-mile Bear Hair Gap loop and the more challenging 13-mile Coosa Backcountry Trail. But since we arrived in the late afternoon, we stuck with the 1-mile trail around the lake (where the colorful leaves made for picturesque reflections) that led to Trahlyta Falls. The scenery was gorgeous as the light reached the photographer’s “golden hour,” and it was refreshing for us to stroll leisurely as the sun set over the surrounding mountains. It would be a bit of an understatement to say that my daughter has a thing for boiled peanuts. And, despite the visions some people may have of the American South, these salty Southern delicacies are not actually available on every street corner. So when we spotted a sign outside Blairsville’s Sunrise Grocery promoting their “World Famous” boiled peanuts, I knew we had to stop. 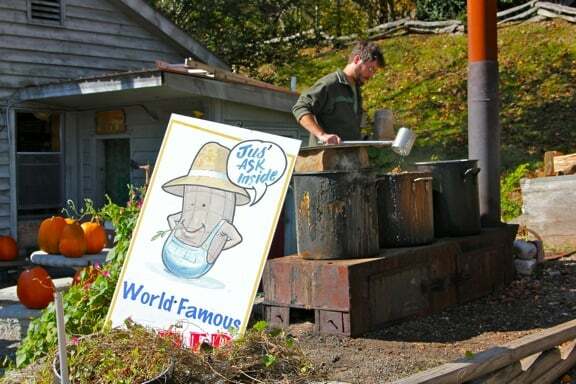 While I cannot say for sure how world famous their peanuts are, I can assure you that they were quite tasty, cooked to the perfect tenderness and served up piping hot right by the side of the road. As we munched our snack, we browsed the store’s ample stock of traditional Southern foods (which included an impressive selection of old school candies), and wound up taking home some country ham, fresh apple cider made from locally grown apples, and 4 different varieties of homemade jams and preserves. I was in Southern foodie heaven! The next day, we decided to hike up Brasstown Bald, the highest point in the state of Georgia at 4,784 feet. Known to the native Cherokee people as Enotah, the mountain’s name comes from a misunderstanding of the Cherokee word “Itse’yĭ” (New Green Place or Place of Fresh Green), which Georgia’s early settlers mistook for “Ûňtsaiyĭ” (Brass). 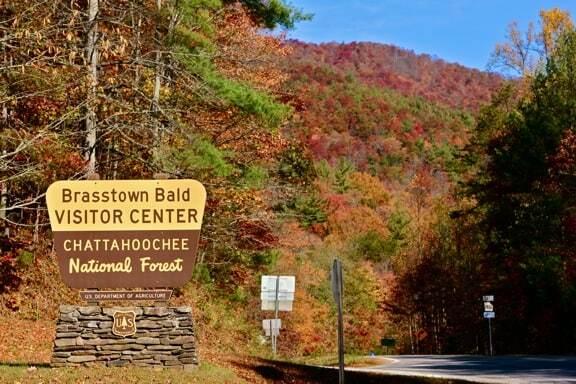 “Bald” does not imply a treeless mountain top in this case, but instead refers to the visitor’s ability to get an unobstructed 360-degree view from the top, where the observation tower provides a spectacular opportunity to view the surrounding scenery. It was remarkable to see how the autumn leaves were considerably brighter at lower elevations, where temperatures had not dropped quite as low as they had on the summit (where there was already some snow on the ground). While savoring the picnic lunch we brought with us, we took in stunning views of rich red, orange and yellows broken up the evergreens of Georgia pine. It looked to me as if someone had poured a huge bowl of Fruity Pebbles on top of the surrounding hillsides. 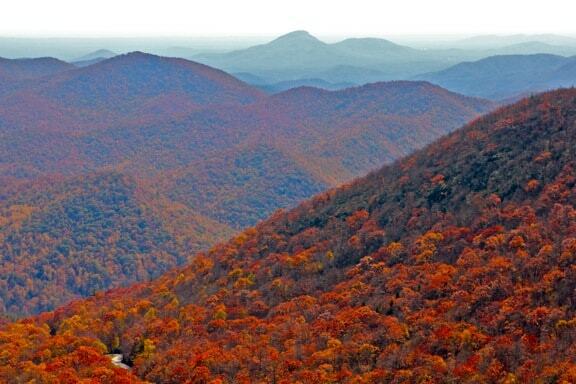 We originally planned on taking a ride on the famed Blue Ridge Scenic Railway that afternoon. But between the exertion of hiking up Brasstown Bald with our heavy gear in the glaring midday sun and the fact that we’d brought our dog, Huckleberry, we ultimately decided to take it easy and stroll around charming downtown Blue Ridge instead. 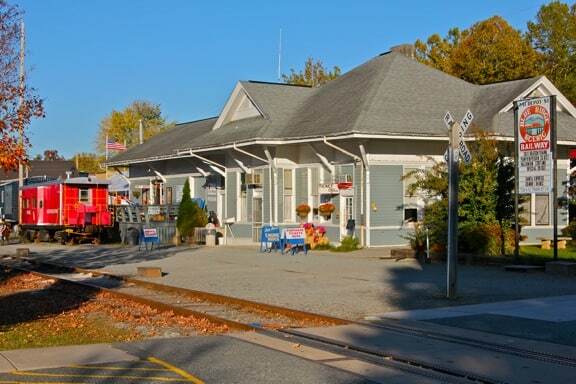 Founded in 1886 as a hub for the railroad, Blue Ridge has emerged in the last 25 years as one of North Georgia’s most popular tourist destinations, thanks in large part to the construction of the Georgia Mountain Parkway. When we arrived around 5PM on Saturday the streets were crowded, but by 6PM we were surprised to see that most shops had closed and the sidewalks were largely empty. Fortunately, we were able to get some delicious homemade fudge from The Chocolate Express after grabbing a bite of traditional Cajun cuisine at Blue Orleans Bistro. On our last day in the mountains, we stopped off at Mercier Orchards, which numerous locals had recommended to us as the best place to pick your own apples. We were warned that the place is packed every weekend during apple season, so we got there right when they opened at 10AM, and immediately understood why the place was so popular. 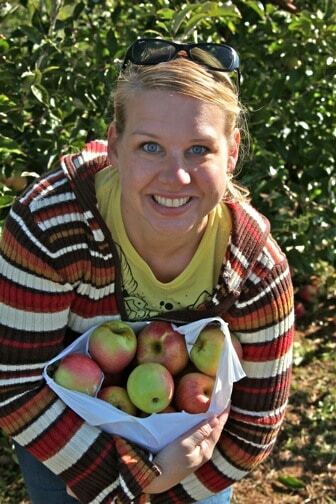 For $10, you get a small grocery bag you can fill to the brim with all the apples you want– Fujis, Pink Ladys, and numerous other varieties were right at the height of their ripeness.